The impact of advanced driver assistance systems (ADAS) is already being felt by the automotive specialty-equipment and collision-repair industries, raising new challenges and opportunities. In this interview, SEMA Vice President of Vehicle Technology John Waraniak shares some frontline insights regarding the current state of aftermarket preparedness, along with association efforts to educate and ready businesses for the rapid changes they face. 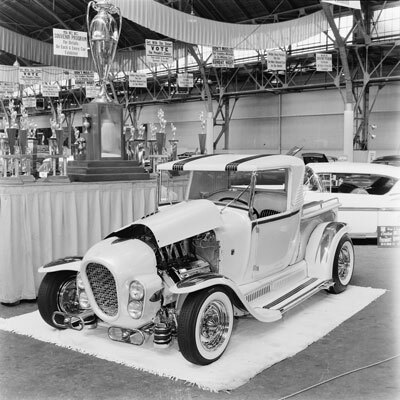 In January, George Poteet’s 1936 Ford, nicknamed the 3-Penny Roadster, was voted America’s Most Beautiful Roadster (AMBR) at the 70th annual Grand National Roadster Show. Its subtle styling changes and impeccable workmanship by the crew at Pinkee’s Rod Shop in Windsor, Colorado, were accented by a subdued, warm-gray paint job meant to evoke chocolate milk. The color was the inspiration for the hot rod’s name, as that’s what the creamy treat cost when Poteet was growing up. The Racing & Performance section of the SEMA Show encompasses carburetors, filters, exhaust systems and many other parts designed to add performance in motorsports applications and beyond. It’s the largest section of the annual trade show, with more than 500 companies exhibiting their offerings for the segment. Within the 2018 New Products Showcase, entries that piqued the most buyer interest were Chevy’s LT5 crate engine, Digipower’s DPW Cutout exhaust system and Comp Performance Group’s FAST LSXHR 103mm intake manifold. For a while, it seemed that American muscle had seen its heyday. By the ‘80s its so-called glory years had faded, displaced by growing consumer demand for compact fuel-sippers and practical sedans. But with recent advancements in turbocharging and other mileage-enhancing technologies, modern muscle is now ironically turning the tables on the traditional passenger car. Ford Explorer ST: The Explorer will get its first comprehensive redesign in nearly a decade, likely for the ’20 model year. Porsche 911 Cabriolet: Visual upgrades are rather mild, with the 992 exterior being heavily based on the outgoing model. Land Rover Defender: The prototype shows a wealth of design cues from the Defender, as well as a few from the Discovery and Range Rover families. When the story of Ingenuity Fab & Speed (IFS) began five years ago, Joshua Boucher was building chassis for a local shop. Like many, he was creating custom designs and fabricating parts for each job, pouring his creativity into them. His parents, aftermarket veterans, convinced him that he was giving his genius away. He realized that he had everything he needed to take ownership of his abilities and work for himself, so he incorporated IFS as an LLC in Montgomery, Texas, and hired his parents soon thereafter. Adding new wheels is still typically among the first modifications consumers make to their vehicles. Whether their vision is to improve aesthetics or performance, this segment of the automotive specialty-equipment market has the potential to make their ride stand out from the rest of the pack. True to form, the 2018 LA Auto Show—with media days branded “AutoMobility”—showcased the latest technological developments in the arenas of autonomy, safety, connectivity and electrification. More than a dozen OEMs held press conferences ahead of the show’s official opening to the public. Several models and concepts were noteworthy for their customization potential, promising business possibilities for manufacturers of specialty equipment.